Happy Tuesday everyone! I hope you had a wonderful weekend. You know I love sharing thoughts, ideas and great finds on Sew Many Ways. Sharing is pretty much the reason why I blog. 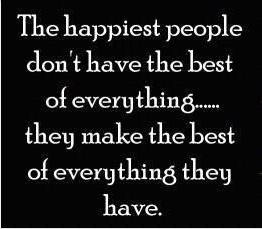 Well, today I want to share something with you that someone shared with me! At the end of March, I received an email from Dinah...a teacher in Indiana. She found a fabulous product in the hardware store that she uses in her classroom and wanted to share it with me. Dinah doesn't have a blog and has given me permission to share her tip with you!! Vent Covers. 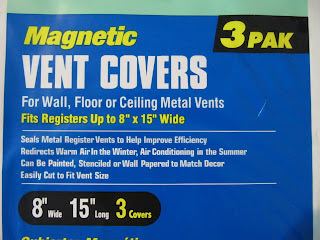 Magnetic Vent Covers that is. 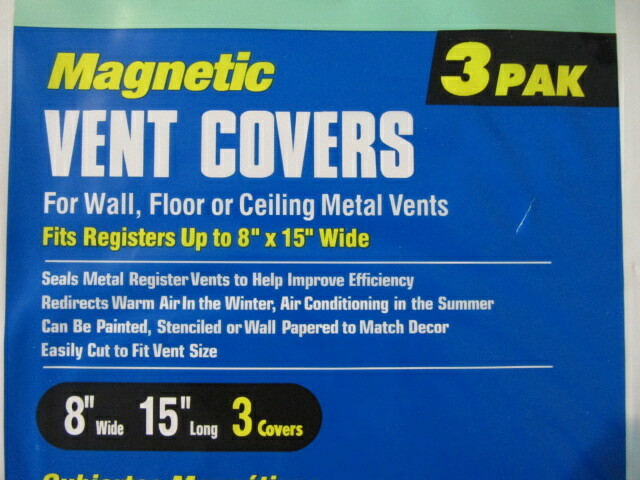 Magnetic vent covers are used to close off heating or a/c vents when you don't want the flow of air through that vent any more. 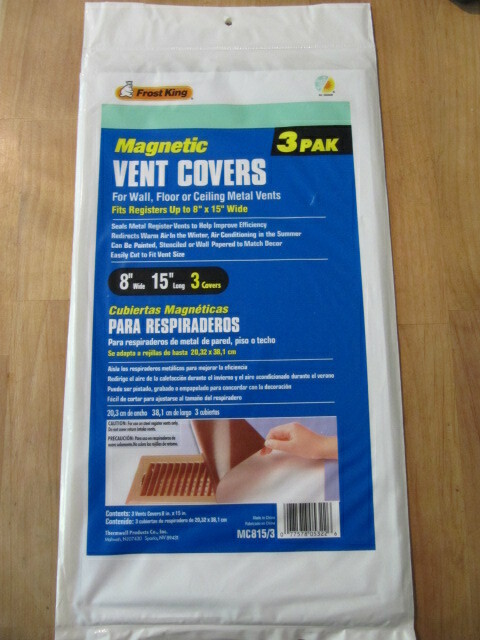 Vents are usually made of metal, so the magnetic sheets work great to seal it off. What works great for me is that the magnetic sheets are BIG...8 inches x 15 inches and there are 3 of them in a package. The BEST part is the package is about $4.50!!! 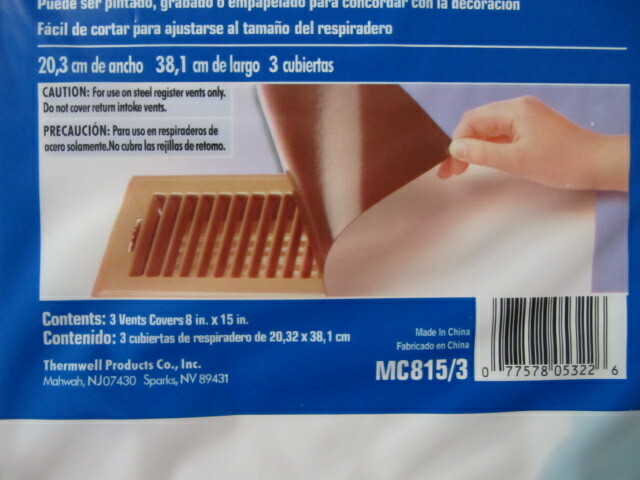 You can find it in the heating section where they sell the air filters and vents. See...3 big sheets just waiting for you to craft away. The possibilities are endless with these sheets...sewing to hold you pins and needles, magnets for the refrigerator (Dinah used puzzles pieces glued to the magnetic sheets) and these would also work great to make magnetic games for kids in the car. They'll never lose the game pieces. Car bingo, matching games, checkers, tic tac toe etc. The best part is you can design and create the games yourself with your children. Maybe you can add some of your ideas in the comments section too!! Thank you so much, Dinah, for taking the time to email me with this wonderful idea...very much appreciated. Something from the hardware store turned crafty...Tool Time at it's best!! Estupendo, espero encontrarlo en España, pero seguro que no será a ese precio. Too funny. 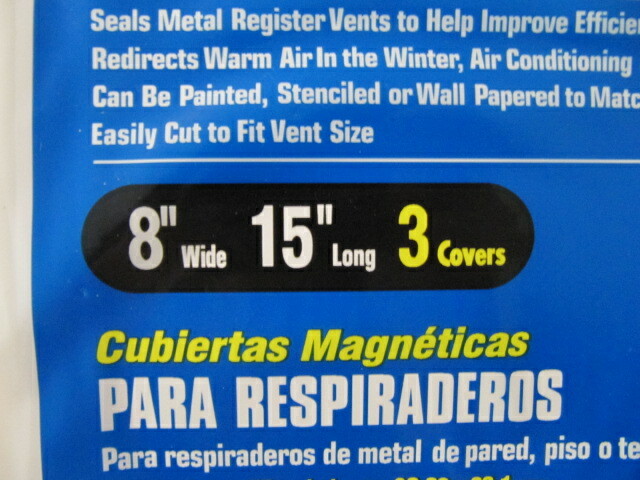 I just bought some of those last week to cover a couple of vents, and, just as the reviews said, they don't work for that purpose. Not enough magnetic force to hold while the air is trying to come through. BUT, it will surely work for crafts. If I use them for anything else, I'll let you know. I've been toying with the idea of making a weekly magnetic menu for my refrigerator. 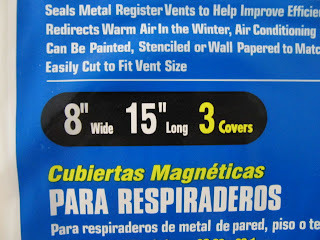 These vent covers would be a perfect starting point. Thanks. Huhmmm... 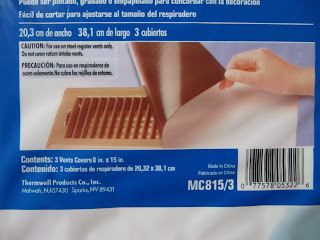 I can glue some lint remover tape onto them, glue them on the wall by the door to the garage, and my husband could 'roll' his legs onto them on his way out to work, to get rid of the cat hair Sapphire rubs on his legs every morning! :-) All kidding aside, I love the tip. Will get some and leave it by my craft desk. Will let you know what I come up with! My DH uses the magnetic sheet material for bumper stickers. He uses the adhesive type, sticks the bumper sticker to it, trims around it, and he can change out what stickers are on the car. Way better than permanently sticking them on the car, or fridge, or file cabinent. Great idea. I've seen some bumper stickers I'd love to have but I'm not a fan of sticking them on. I did that with a bumper sticker I liked but my DH did NOT. It said " my cadet and YOUR tax dollars go to the AF Academy"! There were times I took it off and left it in the car! lol Also good to keep the paint nice. Here in AZ, if you leave the magnets on too long, the paint fades and you get that shape permanently tattooed on your car! Oh, she has graduated now, to the bumper sticker lives on a magnetic bulletin board in my sewing room! I can't tell you how many times I've looked at these laying there, but never picked them up. In fact, just last week! Well, I will pick them up now! These are pretty awesome. I didn't know these existed. I use a magnet sheet for my pins when I am sewing. It was a company logo ad magnet that was getting tossed. So glad to know I can get things like that! !!! This is a great idea!!! I hope to find something like this in Costa Rica. Thanks the both of you , for sharing this with us. Oh my gosh! That is so darned clever...I agree with everyone else who says those things don't work for their intended use, but they would be great for crafting. Thank your friend for sharing! 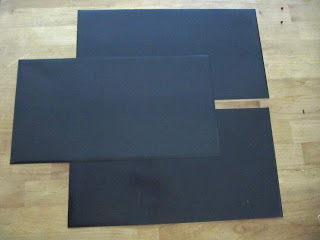 I think slapping some chalkboard paint on the non-magnetic side would make a great label for a metal box. Or the fridge! I have seen a magnetic sheet from IKEA to hold sewing machine feet. When I tried, it was not magnetic. :( So I will definitely try this. Thanks ! I plan to make magnetic Bookmarks w/them. Its a shame to pay $4.00 or more at a book store. For this price I can make one for ever book I read!! I just found your site. I don't sew,I scrapbook. I am loving your ideas. I was thinking how I can make a K-Love.com bumper sticker to a magnet. Plus covering a hollow door to make a desk, I can't wait to try.